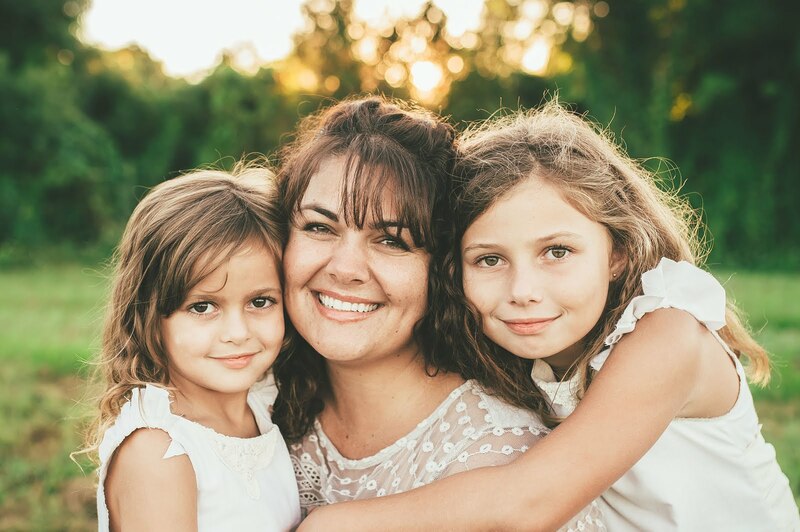 Each year we let our daughters decide if they want to have a small birthday party with close family and friends or go somewhere special for their birthday. The past couple years Savanna has chosen a trip to Universal Studios to tour about the Wizarding World of Harry Potter. Last year she began reading The Hobbit and then chose to read The Lord of the Rings trilogy. 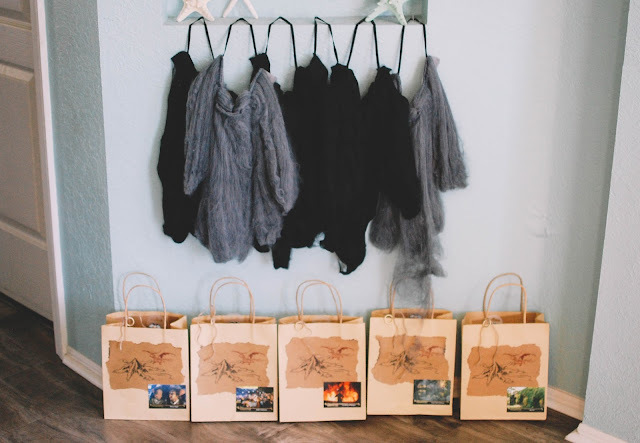 She must have fallen in love because she requested a party for her 11th birthday themed around Middle Earth. I couldn't have been more excited. We watched all the movies leading up to her birthday. It created a fun bonding experience. 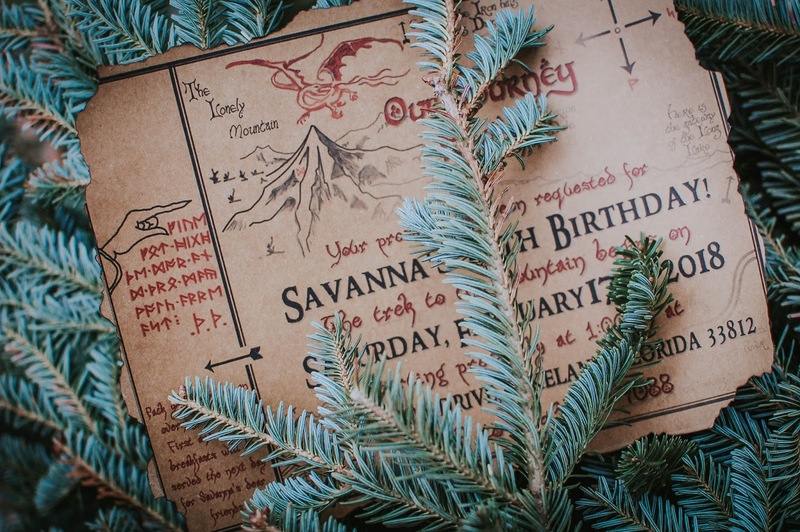 For her invitations I hit up Etsy and landed on these customizable invitations from River Bee Paper. Once the final design and information was decided upon, I printed large sizes on brown craft paper and burnt the edges with a lighter. 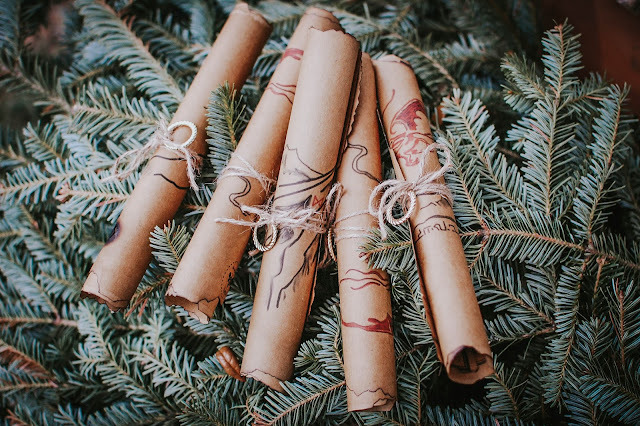 I then rolled them up and tied with twine and a golden ring for Savanna to hand deliver to her friends (she only invited 5 so it wasn't a hassle). I printed a few more out to glue to the gift bags that were handed out to the girls as party favors. I was going to mail the smaller versions to family but I got bogged down and went the Facebook group route. For decorations, Adam used two ladders to make the Misty Mountain, which he covered with cheap tablecloths. 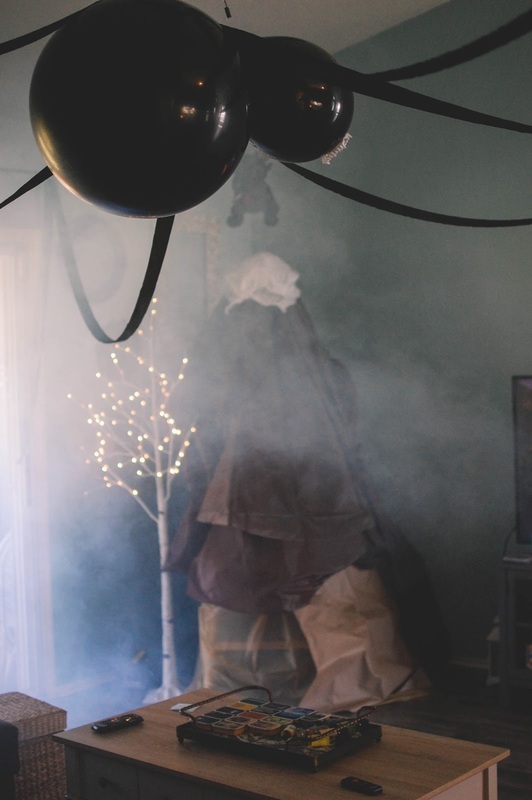 I sprang for a fog machine at Walmart for $30. Worth every penny. Even when I made the smoke detector go off. 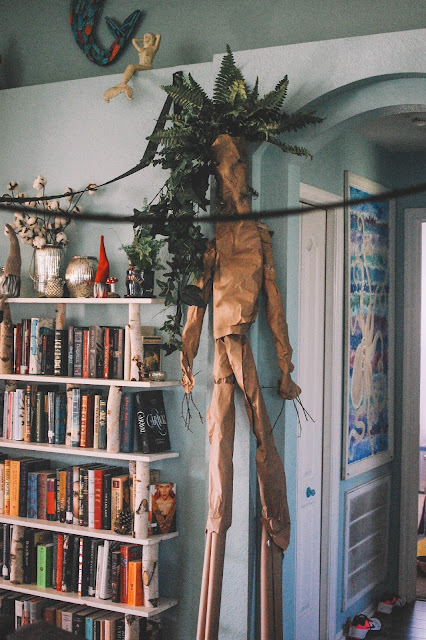 I bought two brown wrapping paper tubes at the Dollar Tree and made my version of Treebeard the Ent. The Eye of Sauron lurked in the corner of the living room while Adam made Shelob perch over the whole scene. Her two big eye were electric tealights and glowed menacingly. The party favors included a used book of The Hobbit that Savanna lovingly wrote a message inside of (purchased at ThriftBooks.com), a bookmark, a hand sanitizer, a tea tin, a lapel pin and a dwarf beard. The beards were worn while the girls went on a quest to rescue me from Mirkwood Forest which just happens to be behind our home. Adam sprayed the girls with spider silk when they walked by and my brother-in-law flashed the Eye of Sauron at them. But the intrepid girls rescued me in the end and emerged from the woods to confetti and poppers thrown by my sister and her sweet fella. The Middle Earth fandom teas came from Adagio for about $5 a tin. 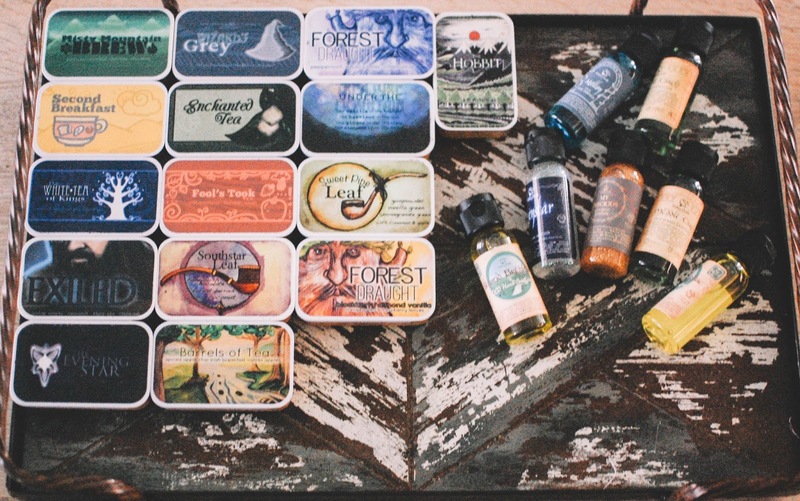 Most were from the Tales & Tea Leave fandom collection found here. The hand sanitizers were from Fortune Cookie Soap Company who just happens to have a One Ring to Rule Them All collection out right now. Each small hand sanitzer was $2.89 each and they smell fan-freaking-tastic. The party was at 1pm so the food was kept simple. I baked lembas, AKA elven bread, AKA waybread, that was basically Scottish Cheddar Shortbread. I loved it. 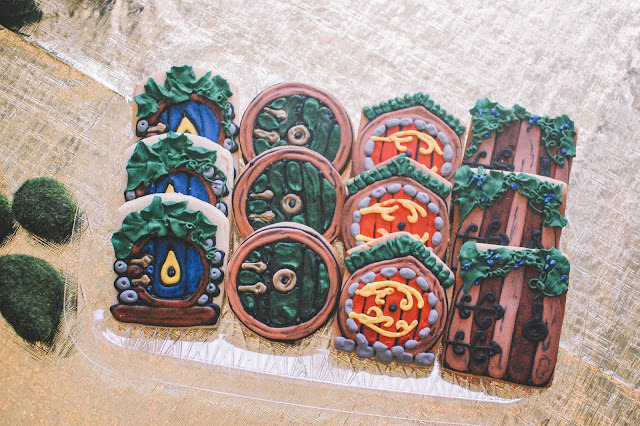 These hobbit door cookies were easily the cutest things on the table. I bought them from Crows Custom Cookies on Etsy and lemme tell ya. They weren't cheap. At $60 shipped for a dozen, it was an investment. Although I don't regret it one bit. They went down the gullet quite easily. I have to say... I ordered them early on to give them plenty of notice, thinking they would arrive about a week before the party. When they arrived a whole month early I was concerned they would be inedible. I messaged the ladies and they assured me that the cookies had a great shelf life. Indeed they did. 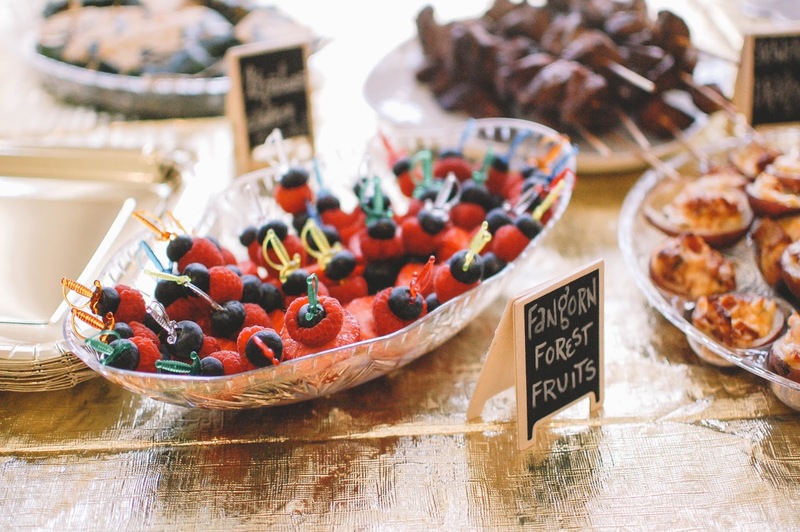 Some simple Fangorn Forest Fruits (a strawberry, a raspberry and a blueberry on a sword) were weirdly popular. They were gobbled up first. I didn't expect the kiddos to eat the fruit first. Poor Smaug. 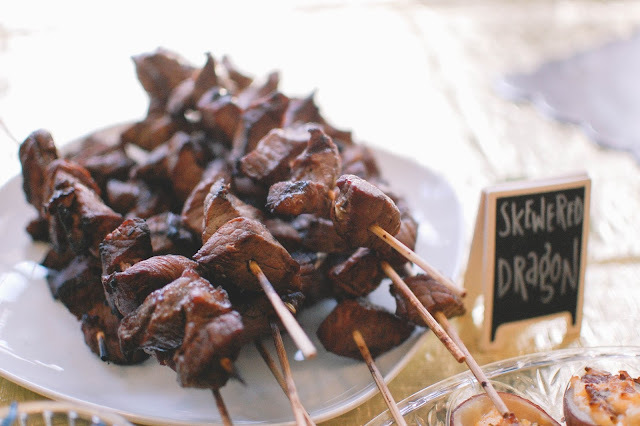 We served up some Dragon Skewers (marinated and grilled steaks). Samwise recommended the Po-Tay-Toes. 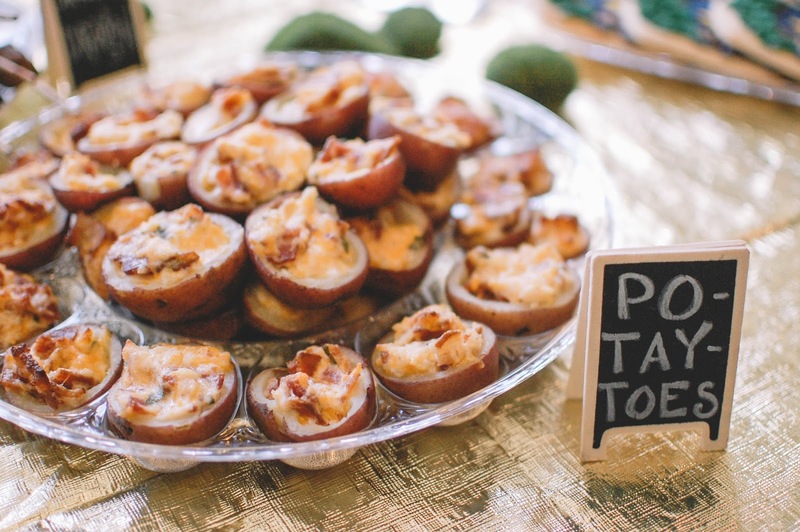 These were tiny red potatoes scooped out and filled with sour cream, mayo, bacon, cheese and fresh herbs. These busters take forever to make but they taste pretty darn good. The One Ring cake really took me for spin. I had the hardest time with this cake from moment one. I couldn't find a plain round bundt pan so after running around town like a chicken with my head cut off I settled on the one I already had with the ripples in it. Then I attempted Italian Buttercream twice (ruining a dozen eggs and countless sticks of expensive butter) then the marshmallow fondant I made and rolled out wasn't big enough so the inside wasn't covered. 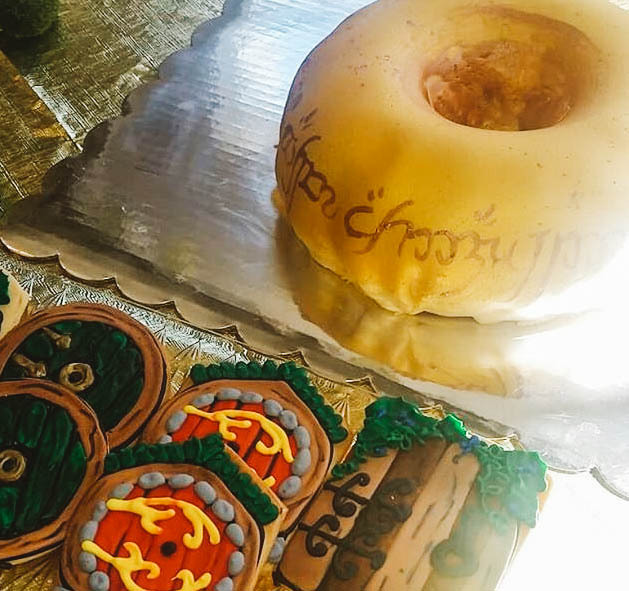 In the end I had a vanilla bean cake with vanilla buttercream and marshmallow fondant in the shape of a ring, spray painted gold and glittery elvish writing to match but it wasn't a gem. Let's just say that. In fact, I must have been pretty over it because the only photo I have of it is one my sister took and posted on her IG. So there she is. The One Ring who can go back to Mordor. It did taste good though. All in all we had a fun time! 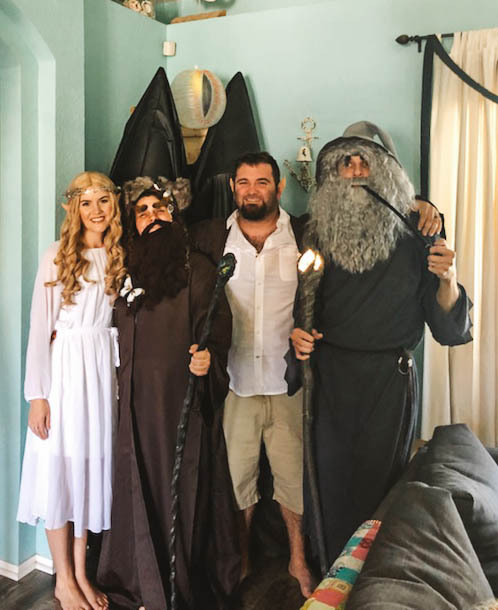 The girls had a blast and Frodo, Gandalf, Radagast (yours truly) and Galadriel all had a wonderful reunion for one special little girl. 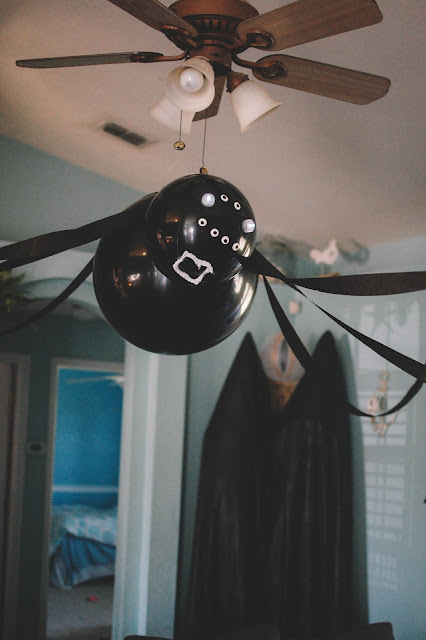 If you could have someone throw you a themed birthday party of your choice and they went all out... what theme would you choose? I think I would choose a Martin Freeman party. I forgot to add that I am almost out of the LSC linen spray that you gifted me- can you suggest something similar that I can get my hands on??? Ah! The Serenity blend? I am going to look and see if I still have your address. I can send you something you may enjoy. Pam is supposed to be opening a few more times and I can see if she will be selling any more of her Aroma Mists. I am trying and liking Sixteen92's linen and room sprays. Urban Mysticism makes a brilliant lavender and peppermint EO pillow/room mist. I will look about and see what else I can find too. I keep checking her website hoping that I can buy more. I will check out Sixteen 92. Wow! You are amazing. It sounds like a perfect birthday party. Thank you Undina! That is very kind. I hope she will look back fondly on her mom dressed as a wizard and fighting for two days with the frosting. :-) I hope you are doing well! Your handsome kitty boy too. She will! And she’ll pass that love and care to her kids many years from now. Now this is my kind of party! It takes me back to my first discovery of The Hobbit. What a world there. How wonderful for her to be discovering this story and having it so lovingly and creatively enriched. Frodo Lives! 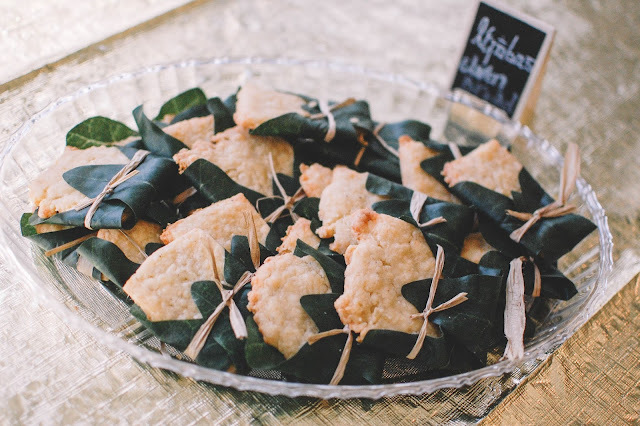 Um, can that be a joint Martin Freeman party? <3<3 I'd probably choose an entire Sherlock Holmes theme with clues and mysteries to solve, featuring Dr. Watson of course. Thank you ever so much for the Freeman tea tin! Those adagio fan formulas are the most wonderful item; imaginative, inexpensive, artistic, collaborative, oh and pretty good tea! Loving your choices here. Well, I'd say you outdid yourselves, but I believe this is just the Julie (and fam) way. I saw your sis' outfit on her IG stories...wow, how stunning, and touching to go all out for her niece, I'd do the same. You all created a lovely and adventurous day that Savanna, nor her friends will ever forget. To be young and get to inhabit a favorite fantasy world would be nothing short of magical. 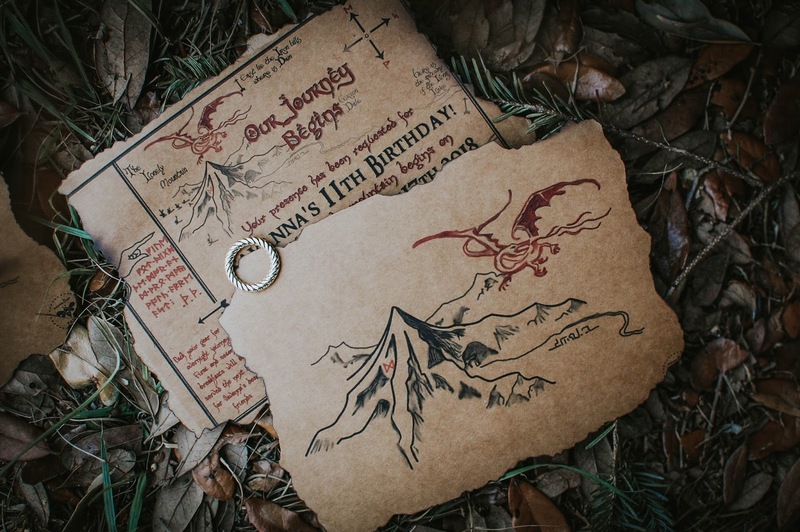 PS The one ring cake looks beautiful from here and the most important part is the taste. Well done! Please do join me! Sherlock would make for an amazing party theme. So much fun to be had. I enjoy the stories as well as the show. My sister is so beautiful. She carried off Galadriel like a true elven queen. I knew I would either be a hobbit lady or a wizard. I probably could have been an orc but who wants one of those at their party?? Thank you! I was feeling defeated there for a bit and I never conquered the Italian Buttercream, but hey. American buttercream is just as good. Oh my gosh, Mom of the Year, this is so outstanding! What a wonderful birthday party - you should be a party planner; you's got the entertaining gift. I love everything, and I'm not even a Rings fan. Did your daughter just love it? How awesome, you guys should be so proud of yourselves for putting on such an incredible spread. Sorry about the cake - fondant (and candy corn) is the work of the devil.